Holiday makers fond of outdoor activities in the mountains shouldn't miss out on a visit to the Zillertal valley. Varied nature landscapes plus loads of rest and relaxation are scheduled at the heart of Tirol. Genuine hospitality coupled with picture-book panoramic views add to a wonderful family holiday, skiing or hiking vacation in Zillertal. The holiday region features 55 peaks beyond 3000 meters altitude, embedded in the splendid Zillertal Alps where snow is always guaranteed and loads of recreational activities are on the program. Winter fans can hit the slopes beyond three thousand meters altitude since Zillertal's 5 ski areas promise unlimited winter fun on endless slope kilometers. More than 800 km of mountain bike trails, three of them are challenging single trails, are spread all over the fabulous Zillertal Valley. Both beginners and real experts can choose from myriad routes and rest stops. Pros shouldn't miss out on trying the Zillertal Bike Challenge, one of the Alps' most demanding stage races. Those who prefer a more leisurely pace enjoy a ride in the scenic Zillertal Bahn cog railway or one of the top modern mountain gondolas offering mountain bike transport. Beginners get together on Zillertal's "Finkenberg - Hintertux Bichlalm" route with moderate ascents. Once arrived on the hut, you indulge in mouth-watering specialties. The trail to Isskogel in Gerlos and further on to Wilde Krimml is quite challenging and requires enough stamina. Uninterrupted views are guaranteed high above the treeline. Sporty bikers also head for the panoramic "Zillertaler Höhenstraße". The Zillertal valley is home to some 1000 kilometers of walking trails, including challenging high-altitude hikes, educational walks and tours to lovely mountain pastures and cabins, such as the Bodenalm in Brandberg. 11 mountain lifts operating in summer make the Zillertal valley a prime destination for walking and hiking aficionados. One hiking option is the tour from the Eggalm top station to Zilljöchl, Ramsjoch and on to lake Torsee. The Alps Nature Park nature reserve is a protected, high alpine area offering innumerable hiking options. It is best explored while walking along the Berliner Höhenweg or the Peter Habeler trails. The Berliner Höhenweg trail and several lovely mountain inns and cabins, including Olperer Hütte and Tristenbachalm, are easily accessible from the hiking resort of Ginzling at the heart of the nature reserve. An action-packed toboggan adventure in Zillertal's winter paradise creates memories that will stay with your family forever. An absolute must for winter fans and nature explorers! The regional mountain lifts take you uphill if you want to reach the toboggan runs effortlessly. Zillertal offers no less than 14 well-prepared toboggan tracks covering a total length of approx. 45 km. Some of them are also floodlit by night, ensuring a memorable night tobogganing experience and speedy downhill thrills. 508 kilometres of perfectly prepared ski slopes offer a variety of fantastic downhill runs for every taste and fitness level, ranging from wide pistes with leisurely gradients to demanding routes that push even experienced skiers to their limits. The Zillertal Superskipass is an all-in-one ticket which connects 179 ski lifts. Zillertal’s biggest advantage is the size of its skiing areas and the numerous options this provides. Altitudes generally start from about 2,000 meters and range up to 3,250 metres, guaranteeing snow all through the winter season and fun for the whole family, as the special areas for beginners and children are located at the highest summit lift stations. But that's not all! There’s something for everyone here – with large funparks, permanent racing and high-speed runs, easily accessible freeriding areas, ski kindergartens and numerous ski lodges. One special highlight is early morning skiing: Early birds can already enjoy their first runs down freshly-prepared ski slopes while other guests are still asleep or having breakfast. The gondola lifts in the Hochzillertal ski area start operating at 7.30 a.m., and the numerous lodges in the ski areas give you a further chance of being first on the piste – just get out of bed and onto your skis and enjoy the slopes, which are still practically deserted. After this, you will enjoy your breakfast even more! The newly-built 10-seater Dorfbahn gondola lift in Gerlos is a milestone construction and a second lift for providing comfortable transport to the skiing areas. The 3-storey building at the valley station in the centre of Gerlos houses a sports shop and a ski rental outlet and also provides modern ski storage and covered parking. The Hochfügen skiing area in the lower Zillertal now also provides the new 6-seater Waidoffen chairlift, which adds to your skiing enjoyment. This new lift features integrated seat heating and ultra-light weather protection hoods, auto-lock child-safety system and a gentle exit gradient. Skiing in the Zillertal mountains is not just about the best ski slopes: A stop with friends on one of the spacious sun terraces or in one of the numerous award-winning lodges will make your day of skiing complete. Culinary delights created from natural local products will top up your energy reserves and prepare you for the next hours of skiing fun. On the menu, you will find Zillertal specialities as well as new creations inspired by the concept of modern, light cuisine. Whether offering top-class international gastronomy or high-quality Tyrolean cuisine, Zillertal chefs all place special emphasis on fresh, local products and attach great importance to using seasonal ingredients. Skiing and culinary delights are thus combined to provide a very special menu for real connoisseurs. The world-famous Zillertal hospitality further adds to the high reputation of gastronomy in Zillertal. 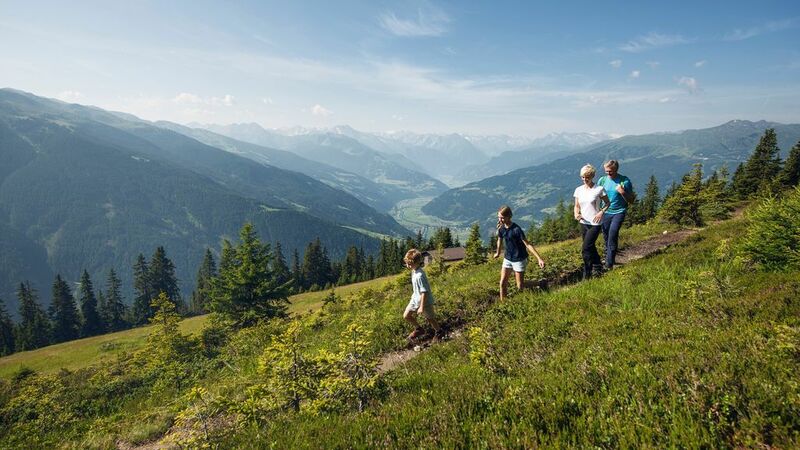 In scenic Zillertal you can choose from about 1400 km of signposted walking and hiking routes, 1200 km of mountain bike and cycle trails, more than 150 serviced Alpine huts and inns easily accessible for families with young children. Additionally, 10 summer mountain lifts offer quick and easy mountain transport. The Zillertal Activity Card makes an ideal summer holiday pass for all ages and preferences, giving access to summer mountain lifts and public transport lines. Furthermore varied other admissions or discounts are included as well!